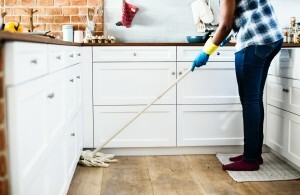 Keeping your home tidy and neat requires a combination or regular maintenance and cleaning. However, over the course of the year, the accumulation of dirt, junk, and personal effects begin to clutter up your space until your regular cleans are barely helping. Whether you enjoy spring cleaning or not, it’s a great way to give your home and family a fresh start. Pima Cleanpro knows the importance of a clean home and has prepared some great tips to consider. It’s fair to say that the majority of your cleaning attention and time is spent on the inside of your home. However, this spring clean, start with the outside of your home. Along with your enlisted family, tour the exterior of your home and look for any items which need your attendance and can be safely performed without the need to call in a professional. This could include a clogged drain pipe, dirt or grime build up on the exterior, or simply debris which needs to be raked and cleaned away. Whatever it is that needs to be done, now is the time to do it and prevent a small piece of home maintenance from becoming a large and expensive problem for you and your family. During your regular clean it’s likely that your simply vacuum and clean around your large furniture items, such as couches, entertainment units, or even refrigerators. This time around, move each of your large items and thoroughly clean the space where they were. Not only is this a great cleaning tip, but it also provides you with an opportunity to inspect for damage. For example, if somebody in your family spilled water underneath your couch and it went unnoticed, there could be mold growth occurring without you even noticing. Additionally, if there has been movement in your house and a crack behind the entertainment unit has occurred, it will go unnoticed. In addition to providing superior carpet cleaning services, Pima Cleanpro can also bring your upholstered items back to life, such as your couch and dining chairs. To find out how Pima Cleanpro's ION exchange cleaning system can bring both your carpet and your upholstered items back to life, call (520) 954-2119 and book a convenient appointment. The spaces in your laundry where you keep your cleaning supplies and the cabinets underneath your kitchen benches where you store your large cooking items can offer the perfect space for mold growth, which can lead to health problems and isn’t something you want in your kitchen. The combination of darkness and moisture and residue from your cleaning products and cooking items can, over time, can serious mold problems. The problem is that these areas don’t often get a good inspection. This spring clean, thoroughly clean out cabinets which resemble this, using a flashlight or even just your phone to get a better look. When it comes to your carpets, it can be tempting to simply vacuum yours again and call it a day. However, the reality is that your vacuum cleaner isn’t able to remove stains or bring life back in your carpets and can, in some instances, cause damage from over-vacuuming in an attempt to achieve unreasonable results. Instead of settling for a regular vacuuming this time around, opt for a professional carpet cleaning service to get your carpets looking good as new. The reason for this tip isn’t purely for looks, it’s also about the comfort and health of you and your family. Throughout the course of the year, your family and visitors will have walked in a range of debris and pollutants which will have become lodged in your carpet. Over time, this can accumulate and trigger allergies and reduce the air quality in your home. A professional carpet cleaning service is the best way to remove these pollutants. Of course, this isn’t a total list, however, be sure to add these considerations to your current cleaning list for a more thorough job. When it comes time for your carpet cleaning, speak with Pima Cleanpro at (520) 954-2119 and find out how Cleanpro's ION exchange carpet cleaning system can not only bring your carpets back to life but ready to be walked on in a matter of hours!